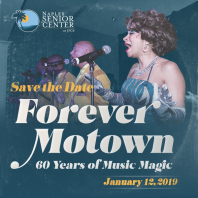 Naples Senior Center at JFCS celebrates 60 years of music magic with Forever Motown, an Evening for Better Tomorrows. Please join us on Saturday, January 12 at Royal Poinciana Golf Club for our annual fundraiser as we dance the night away and raise funds critical to providing Greater Naples seniors and families with the tools and resources they need to thrive. The 2019 event falls on the same day as the 60th anniversary of the founding of Motown Records. Guests will enjoy a performance by Shadows of the 60’s, a Motown tribute band. For tickets, sponsorship opportunities and more information about the 2019 event, CLICK HERE.